"Harold Roth is an extraordinary man�wise, generous, and deeply entwined in the mysteries of the green world from first-hand experience growing, using, and loving plants. His work adds to our deeper understanding of our plant allies, fleshing out folklore and putting our traditions into deeper context. I�ve learned so much from him and know that with The Witching Herbs, you will too." most prized plants, how best to access their gifts, navigate their dangers, and communicate with their plant spirit familiars. The Witching Herbs is a must for every witch�s library." � Judika Illes, author of Encyclopedia of Witchcraft, Encyclopedia of 5000 Spells, The Big Book of Practical Spells, and other books devoted to the magical arts. "This book is the best thing to happen to wortcunning this century." � Jason Miller, author of Financial Sorcery and The Sorcerers Secrets, and creator of The Strategic Sorcery Course. "It is a book easy to recommend, a delight to read, a book that deserves a place not only on the bookshelf, but as a companion in the garden of witching herbs." � Nicholaj de Mattos Frisvold, author of Craft of the Untamed, Palo Mayombe: The Garden of Blood and Bones, and Exu and the Quimbanda of Night and Fire. Harold Roth is a leading authority on plant/herbal magic. His new book, The Witching Herbs, is an in-depth exploration of 13 essential plants and herbs most closely associated with witchcraft�13 because it�s the witching number and reflects the 13 months of the lunar calendar. The plants are poppy, clary sage, yarrow, rue, hyssop, vervain, mugwort, wormwood, datura, wild tobacco, henbane, belladonna, and mandrake. Roth writes simply and clearly on a vast amount of esoteric information that is not easily found elsewhere and will be greeted enthusiastically by those who already have extensive experience and libraries. It is unique in that it combines mysticism with practical instructions for growing each plant, based on Roth�s 30 years of gardening expertise. Each chapter focuses on one plant and includes information on its unique plant spirit familiar, clear how-to instructions for magical projects, and pragmatic information on growing and cultivating. 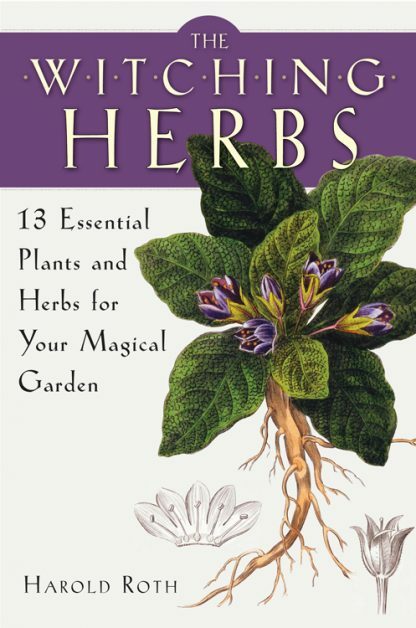 The Witching Herbs is the essential plant-worker�s guide. Roth is not only a successful gardener, but also a magician and scholar of the occult. No other book blends clear, practical gardening techniques with equally lucid and sophisticated plant magic so successfully. Harold Roth is among the foremost authorities on plants within the modern occult community. For the past 15 years, he has owned and operated Alchemy Works, an online store focused on herb magic, where he crafts and sells incense, potions, and magical oils. The Witching Herbs has been in the works for a decade and is eagerly anticipated. Visit him at www.haroldroth.com.